The second part in my series of interesting places I ate while we were recently on Maui. Today: eskimo candy, touristy seafood, and sensational sushi. Eskimo Candy is what they call smoked salmon. 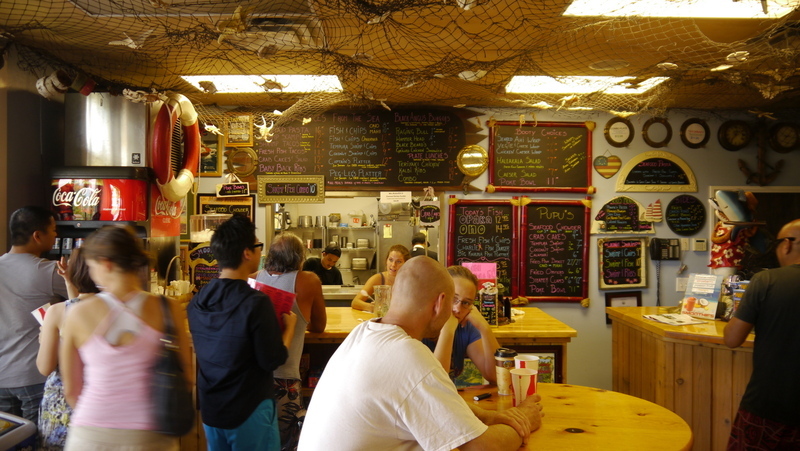 Eskimo Candy is also a small seafood restaurant located across from a Napa auto parts store in the beach condo town of Kihei, on the south side of Maui. Open weekdays only, there’s only a trio of tables and much of the business is takeout. The menu is mostly fish and freshness is the name of the game. An order of fish and chips served with slaw. 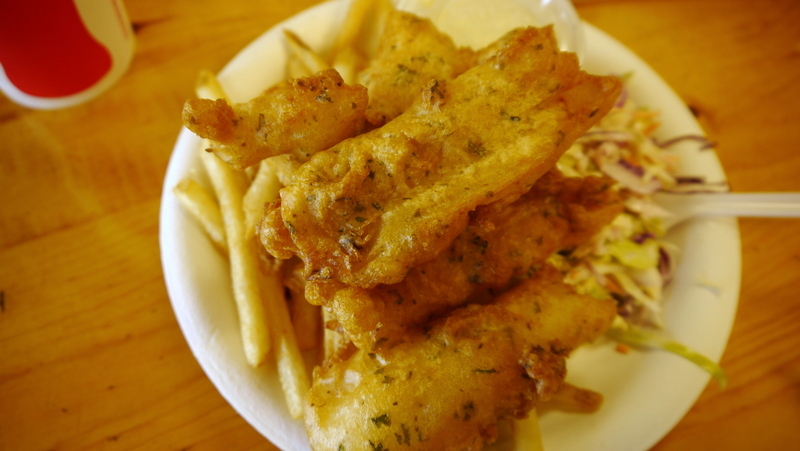 The catches of the day are listed on the board and are available in many forms, including fried in a light beer batter and served with fries. 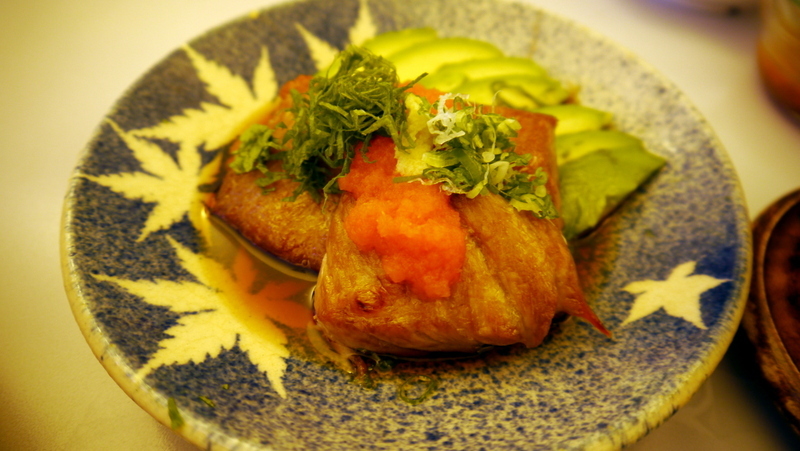 This was opah (also known as moonfish), a firm white fleshed fish that is a byproduct of longline tuna fishing. Really good. The prize catch, though, is their poke rice bowl. Poke (pronounced “poh-keh”) is raw fish (usually tuna) salad. Eskimo Candy serves four types: a spicy poke, one with fukikake (dried seaweed and sesame seeds), one with shoyu (soy sauce), and one with wasabi. 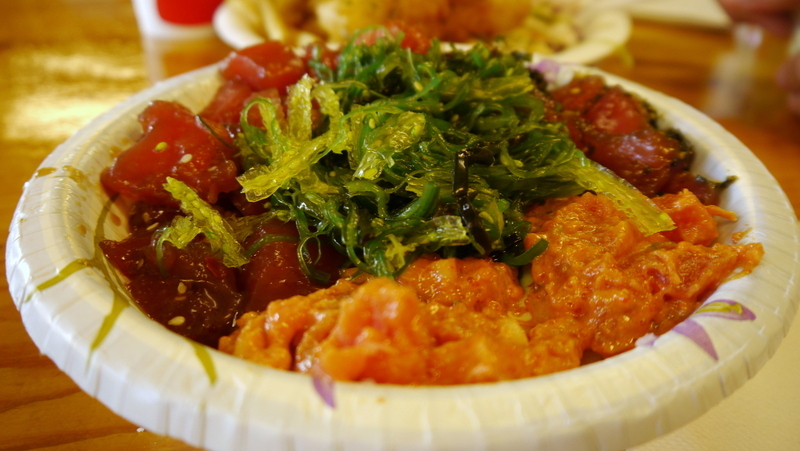 The fish is really fresh, cold, and firm – the best quality poke I’ve eaten. Also worth trying (although not seafood) is their chicken teriyaki. Lahaina is the largest town on the west side of Maui, an old whaling town that dates back to the 1800s. It is a major tourist area with a charming downtown of shops and sights to see. We had lunch at the Lahaina Fish Company, a restaurant that sits on the harbor and is listed in the Lonely Planet as a worthwhile place to eat. 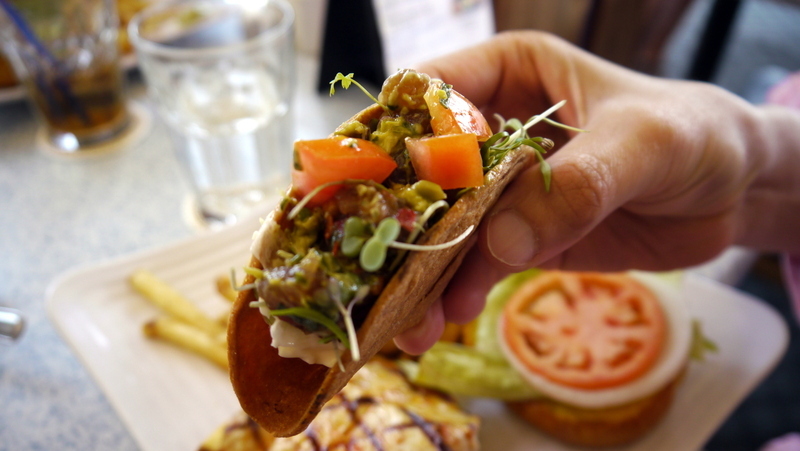 A poke taco appetizer consisted of four very crisp tortilla shells served with okay poke and garnishes including edamame guacamole. It was passable but the shells were super crunchy, a bit too much so. 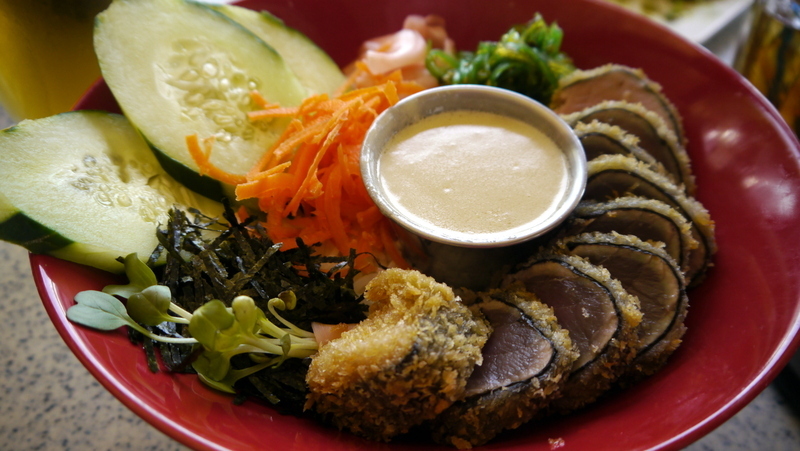 One of the specials was described as an “Ahi Sashimi ‘Katsu’ Rice Bowl”. Of course, this is a contradiction in terms. Sashimi is raw and katsu is fried. Sure enough, they used middling quality ahi tuna, wrapped it in nori, lightly breaded it then briefly fried it. It was served with fresh seaweed, carrots, dried seaweed, and a few other greens on a large serving of rice. The so-called “wasabi ginger buerre blanc” dressing didn’t add anything to the dish and the portion of rice was so large that the last quarter of the bowl (despite mixing the ingredients) was plain white rice. 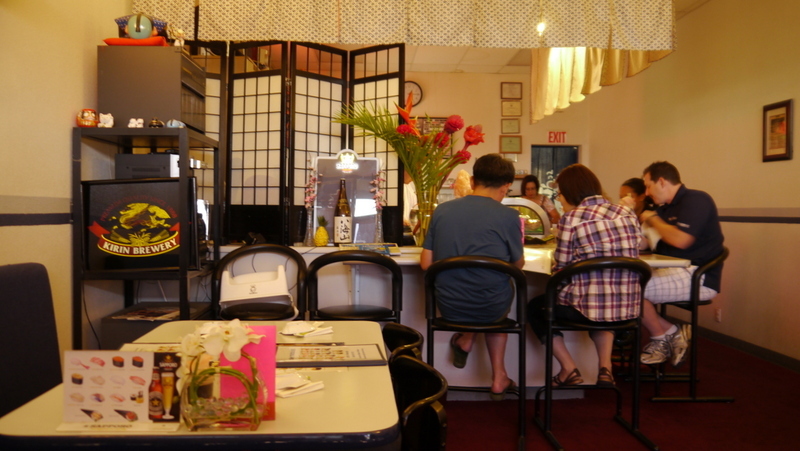 After eating abused ahi sashimi in Lahaina, it was a relief to come to Sushi Paradise. 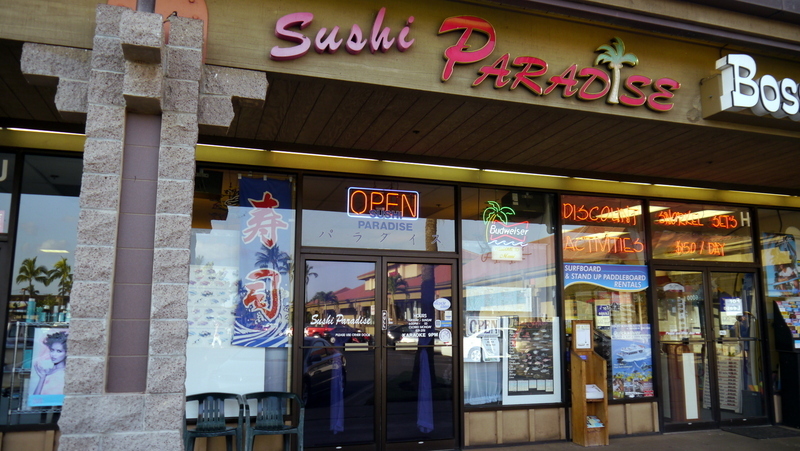 Located in a strip mall in the condo town of Kihei, Sushi Paradise puts on an unflattering face. The inside is small and spartan but it gets busy. If you don’t make reservations, you could easily face a wait of up to two hours. Tawn and I shared a “Paradise Dinner” for $60, which includes a selection of sashimi and sushi, sunomono, miso soup, chawanmushi, and a choice of rolls. We also ordered a few specials, which inflated our bill. 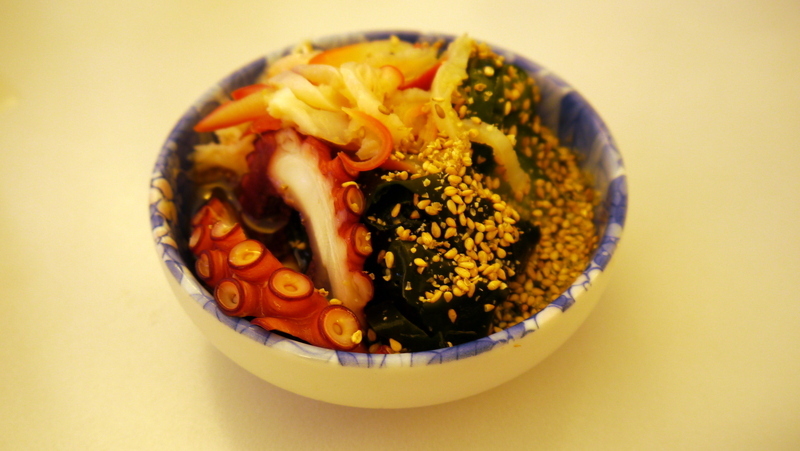 The sunomono, or pickled seafood salad, featured fresh tako, or octopus. The key to very tender tako is that it has to be massaged before it is cooked. Otherwise, it is just a lump of rubber. 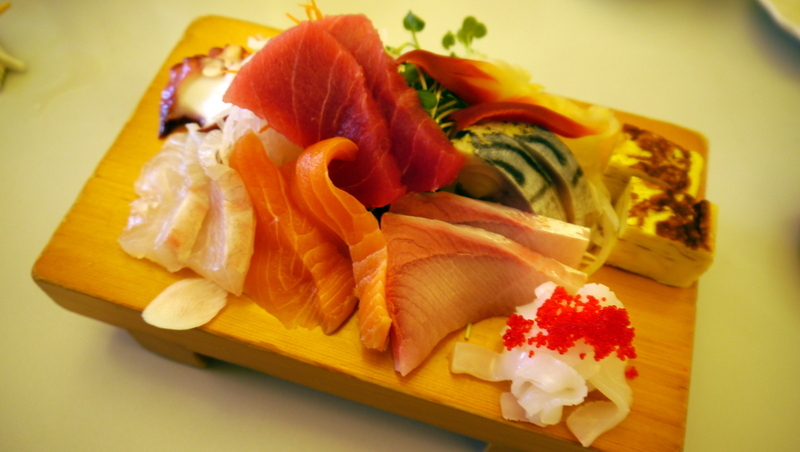 Our selection of sashimi: red snapper, salmon, yellow tail, squid, octopus, tuna, surf clam, mackerel, and sweet egg. Some of the best quality fish we’ve had outside of Japan. Hard to speak too highly of this restaurant. 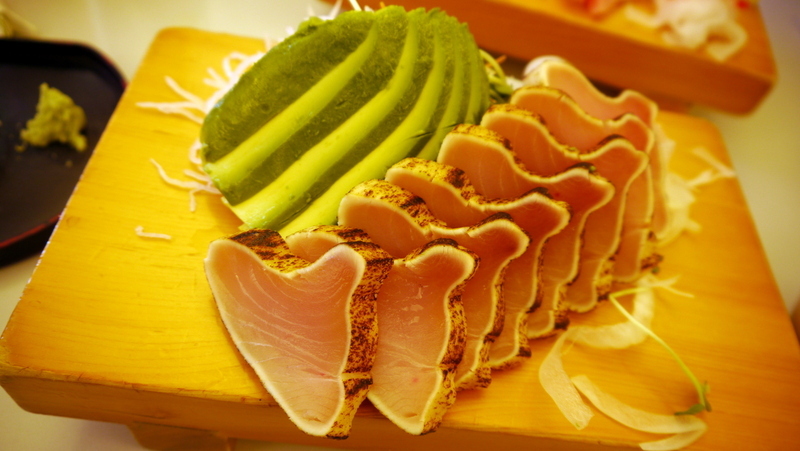 One of the specials was a very lightly torched albacore tuna served with avocado. Not only very tasty, also very beautiful to look at. The very essence of Japanese cuisine is that food should be pleasing to all the senses. This dish achieved that. 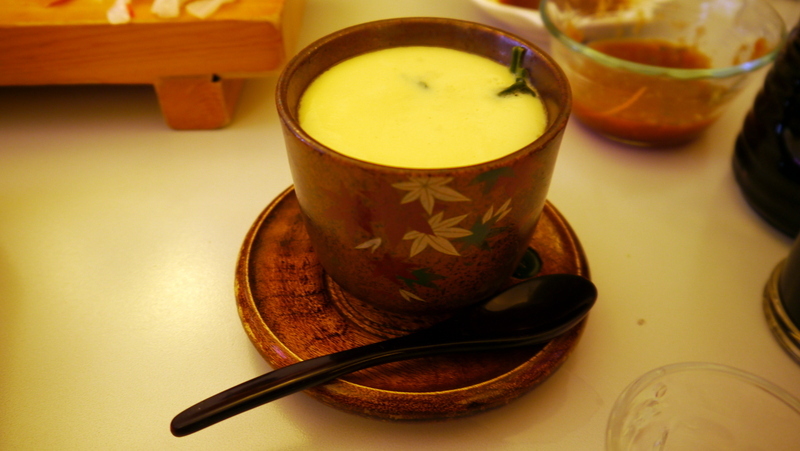 Chawanmushi is a steamed egg custard dish. Our had spinach in it, which was mostly near the bottom of the tea cup in which it is served. The key to this dish is that it has to be strained to remove any clumps or scrambled bits. If it is cooked to the correct point, it is gently solid with a velvet texture. As you might expect, Sushi Paradise has mastered this technique. Another special was lightly fried fish belly (don’t remember the type) topped with a mixture of soy sauce, scallions, and grated radish. Deceptively simple but very complex flavors. Our sushi plate: tuna, red snapper, yellow tail, salmon, shrimp, eel, sweet egg, plus a spicy tuna roll. All very fresh fish. The shrimp was perfectly done, crunchy but not tough. As you would imagine, I’d recommend you go to Sushi Paradise next time you are on Maui. This entry was posted in Uncategorized and tagged Candy, Dining, Eskimo, Fish, food, Hawaii, Kihei, Lahaina, Maui, Pardise, Restaurant, Seafood, Sushi by christao408. Bookmark the permalink. More more more!!!! I swear I gain weight everytime I visit your blog. Sushi Paradise looks like my type of sushi place! 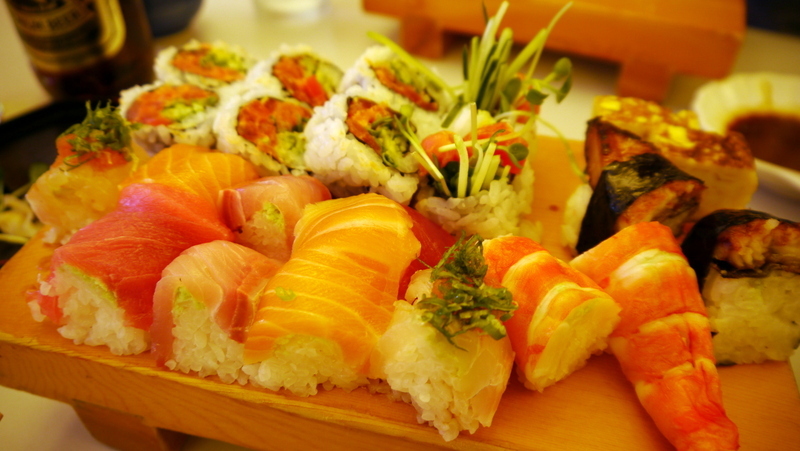 Ooh, that’s very nice and fresh sushi and sashimi dishes! I remember eating at the Lahaina Fish Company, ordered Mahi Mahi, it was really fresh and meaty! Love Japanese food!! They all look very drooly! Looks like you are having a great time there, Chris! ok. im hungry now. damn you, chris. excuse me, but i need to go to the kitchen right now. mm… poke. that sushi looks good too! did you get to eat other local fish besides the opah? The last time we were in Maui was in 1994. The eateries there were not the best and food not as appetizing as they have now. Your pictures are so good and the food looks marvelous. Wow, that food looks amazing! The pics made me hungry and I don’t even like sashimi. @paperblanks – The more I learn about sushi, the more I appreciate the variety that is very locale-specific. Certainly, the sushi in landlocked areas is much less diverse. @ZSA_MD – I have to say, compared with the food we had on Kauai last year, Maui has a better food scene. @aPieceOfTheSky – Glad you enjoy them. @kunhuo42 – Ono, opah, mahi, uma… all of Oprah’s friends. LOL Sorry… incorrect joke. @CurryPuffy – The view from the dining room is fantastic there… sadly, I was underwhelmed by the food. @rudyhou – Sorry for doing that to you, Rudy. @I_love_Burma – Maui was a fun time, all the more so because we were with Andy and Sugi. @ElusiveWords – Digital calories? @slmret – In my opinion, it should be *everyone’s* type of sushi place! =D@whyzat – Gosh, sorry for having that effect! Ha ha! @yang1815 – In two words, yes.